Buying a camera is a fateful choice: you're choosing something that you're going to use to chronicle the highlights of your life, your most cherished memories, or maybe you just want to take random photos of statues and arches on your trip to Rome. In any case, the layperson really doesn't know what the difference is between the Canon PowerShot A620 and the Kodak Z740 other than one's bulkier than the other or one has a nice silver case. Chandoo over at Pointy Haired Dilbert did an analysis of camera model sales rank on Amazon versus popularity among Flickr users. 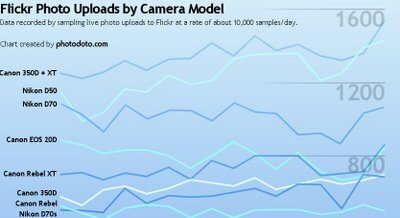 The EXIF data of Flickr photo uploads was analyzed (about 10,000 of those photos uploaded each day), and camera models tallied to get the Flickr stats. 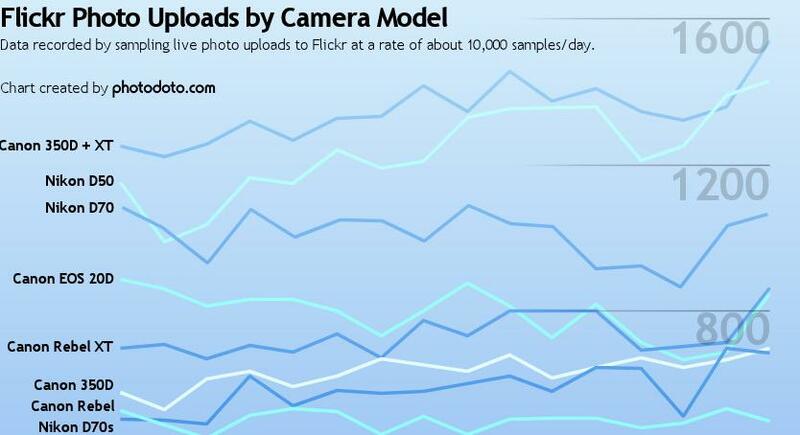 They show that Flickr users have a distinct liking for Canon and Nikon cameras. He plotted the Flickr and Amazon data together and found once again that Canon was the top choice. So it looks like both Flickr and Amazon agree that a Canon digital camera is likely to be the superior choice for budding photographers. If in doubt, choose a Canon? On a side note, if the data gathered from Flickr and Amazon were ever in disagreement, I'd go with the Flickr stats since it gives you two pieces of information: one, someone must have bought the camera in question, and two, they were proud enough of the photos they took to share them in public.